I just got the new issue of Cog Magazine through (thanks Kevin!) and it looks great. Go grab yourself a copy from Tour De Ville. Its full of lovely pictures and includes features on KyotoLOCO, Six Day Races in Berlin and interviews with myself and John Prolly. And a whole lot more. Kevin accidentally got my name wrong which I found funny and he found embarassing! 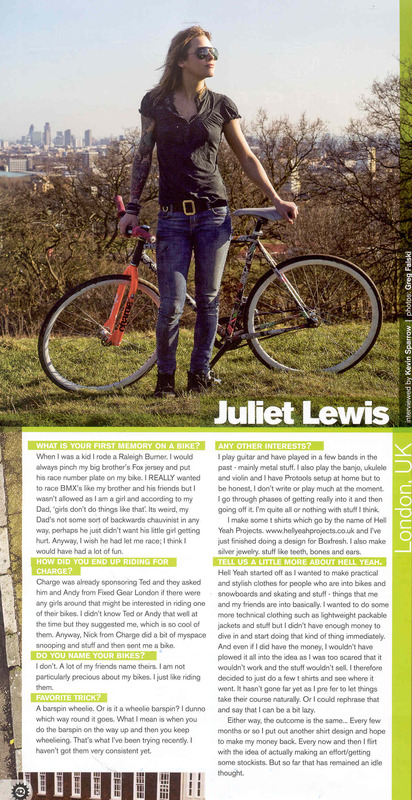 I think Juliet Lewis is cool; don’t mind sharing her name at all! Unfortunately print mags are not like blogs where you can “edit post”! thanks for being an Awesome person Juliet! we are FIXED GEAR GIRL TAIWAN…. may i use your photo on my blog? hello FIXED GEAR GIRL TAIWAN! i’ve been called worse things…..! you look like Axel Rose…. i hope i dont look like he looks now – fat, mental and with a dodgy weave on!